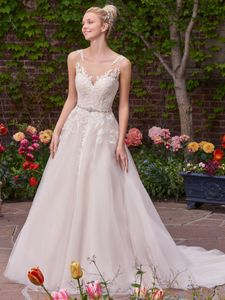 Description: A lace bodice and illusion bateau neckline add romance and enchantment to this tulle ballgown. A unique illusion lace back features cascading keyholes, while a Swarovski crystal-embellished belt adds a touch of sparkle. Finished with covered buttons over zipper closure.